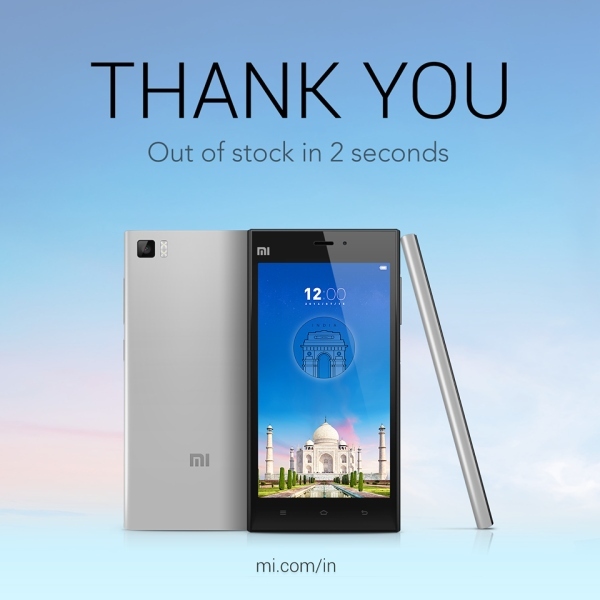 You read that right – 2 seconds is what Xiaomi took to sell 15,000 Mi 3 units in India. The third flash sale, which took place on Flipkart was of very high interest and had more than 150,000 registrations before the start of the trade. If you ever thought how in the world can a person complete a purchase in 2 seconds, you are right, its impossible. So, how do Xiaomi calculate the timing? Well, it's not about completing your order, it's all about managing to put a unit into your cart that Xiaomi counts. It's not the best figure for comparison purposes, but it's certainly one Xiaomi would want you to remember. The statistics from today’s sale can be looked at in two aspects – one, the demand for the Mi 3 in India is very high and the company is quickly making a name for itself in one of the major markets. The other way of looking at it is an embarrassing situation for Xiaomi, who had stocks that could last for only about 2 seconds. The Chinese manufacturer seems to be under prepared and has to work harder to meet the demand of Indian consumers. There is no doubt that Xiaomi Mi 3 provides a great bang for your buck with a powerful chipset and top notch hardware. Having said that, if the company doesn’t manage to up the pace with its production and meet the demand, then it might soon attract criticism and hatred from its potential consumers in the sub-continent. We went a step ahead and dug up some more mind boggling numbers for you. With the sale of 15,000 Mi 3 units, Flipkart saw an exchange of INR 209,985,000 (about $3,450,834) in two seconds! And, these numbers are beside the regular sales. So, the online retailer, who recently raised $1 billion in funding, shows it can really handle pressure well. Thanks KY for the tip!